There are some great top-end smartphones available but plenty of people still want something more affordable. In this respect some of the Nokia Lumia phones that run the Windows Phone operating system are a very attractive proposition. Today we want to show you the Nokia Lumia 620 vs. 720 and 520 in visual reviews. Yesterday we posted an article with a video comparison of the Lumia 520 and 620, and today we have two further videos to share with you that you may find interesting if you are thinking of purchasing one of these phones. The first new video looks at the Nokia Lumia 620 vs. 720 and the second shows the Nokia Lumia 520 vs. 720. Before you view the though, we’ll give you a brief rundown of the major specs so that you have an idea of what they each have to offer. Starting with the Lumia 620 this has a Qualcomm Snapdragon S4 1GHz dual-core processor and a 3.8-inch display with 800 x 480 resolution and 246 ppi. There’s 512MB of RAM and 8GB of internal memory, expandable with microSD card slot. It also totes a 5-megapixel rear camera, VGA front-facing shooter, and has a 1300 mAh battery. The Nokia Lumia 720 is powered by a 1GHz Qualcomm MSM8227 dual-core processor, has a 4.3-inch display with 800 x 480 resolution and 217 ppi, 512MB of RAM and 8GB of internal storage, expandable via microSD. It sports a 6.1-megapixel rear camera with Carl Zeiss optics, a 1.3-megapixel front-facing camera, and a 2000 mAh battery. On to the Lumia 520 and this includes a 1GHZ Qualcomm MSM8227 dual-core processor (the same as the 720), and has a 4-inch display with 800 x 480 resolution and 233 ppi. Like the other two it has 512MB of RAM, and 8GB of internal storage, expandable via microSD. The 520 also has a 5-megapixel rear camera but this phone has no secondary camera, and there’s a 1430 mAh battery. All three phones run the Windows Phone 8 operating system, and as you can see certain aspects of them are quite similar. The comparison video that you can see below of the Nokia Lumia 620 vs. Lumia 720 is over 7-minutes long. It shows the designs followed by the displays, keyboards, applications, performance, cameras and more. As you might expect, the Lumia 720 comes out tops, largely thanks to its better camera, battery life and call quality. However, the Lumia 620 is still noted to be a nice enough handset, with its cheaper price tag and more compact form making it preferable to some people. The second video showing the Lumia 520 vs 720 is 8-minutes long and again it gives an excellent look at both devices. It compares much of the factors shown on the first video, looking at design, cameras and displays for example. Again both handsets are deemed to be decent enough, although there is criticism of the dim display on the Lumia 520. While the Lumia 720 is ultimately the superior device of the two, once more it may come down to price and the Lumia 520 is the cheaper option. You may also want to take into consideration the dimensions and weight of these three Lumia smartphones. The Lumia 620 measures 115.4mm x 61.1mm x 11mm and weighs 127g, while the Lumia 720 measures 127.9mm x 67.5mm x 9mm, weighing in at 128g. Finally the Lumia 520 has dimensions of 119.9mm x 64mm x 9.9mm, and it weighs 124g. 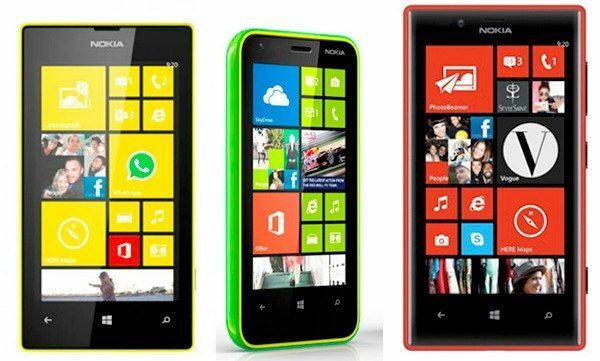 The image below shows the Nokia Lumia 520 on the left, the 620 in the middle and the 720 on the right. If you view the videos below this story with comparisons of the Nokia Lumia 620 vs. 720 and 520 we’d be interested to hear what you think. Are you thinking of purchasing any of these three Windows Phone handsets? If so, which do you think is best for you? Feel free to send us your comments on this as we’re always interested to hear from our readers.